I DNF’d this book, so there’s no star rating. I didn’t want to, but I just wasn’t feeling it. This book is a like a cloudy day with no sun, just black clouds everywhere. Every time I picked it up it was the same thing, just leaving me more and more empty on the inside. The writing is good but the characters are stiff and wooden, the action was super slow to develop. I made it to page 200 before just putting it down for good. 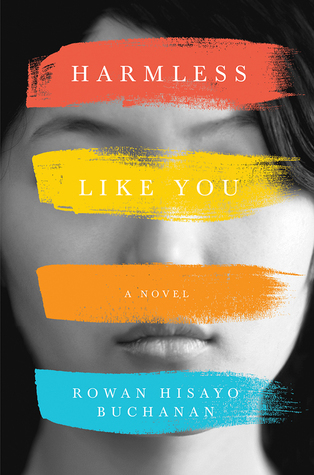 ‘Harmless Like You’ is the story of Yuki, a Japanese-American girl growing up in NYC in the late 1960s. Her parents move back to Japan around the age of 16 and leave her in the care of her friend, an amoral model by the name of Odile and her mother, Lillian. Lillian is physically abused by her boyfriend, Lou. Yuki begins starving herself, and eventually moves in with Lou, who also ends up abusing her. She quits school and longs to be an artist, yet she doesn’t pursue this dream. Yuki marries a friend, a boring dude who stifles her creativity. They have a son. Cut to present day: the novel also follows the story of Jay, a douchebag of a guy who hates his wife. He also feels no paternal instinct toward the baby he has with her and eventually cheats on her. We later learn that Jay is Yuki’s son whom she abandoned many years before in pursuit of her artistic dreams. Yuki’s chapters are in a detached third person, Jay’s in brief, first person narration. It doesn’t do anything for the unrelenting bleak tone of this novel, it’s the same all throughout. Don’t get me wrong, there’s nothing wrong with somber reads. I just think what killed this book for me is that I have to be in the mood for such reading and now was not such a time. I do recommend it, however, perhaps you will get something out of it and can explain it to me.